West Point Industries was founded in 1868 to produce castings and manufactured components for area textile manufacturing mills. Local businessman Amos Huguley purchased the original business in 1931 and immediately began to expand its capabilities by developing a machinery product line for the textile industry. West Point has continued to develop new machinery products for the textiles, battery, rubber and paper industries and for many years has "set the standard" for innovative designs for process machinery. The company began exporting in 1948 and since that time has developed customers in 74 countries around the world. In 1998, the company purchased the assets of a direct textile machinery competitor, the Reed-Chatwood Company of Rockford, IL. West Point still maintains parts and Service for all Reed-Chatwood equipment. West Point has continued to diversify by marketing our manufacturing capabilities to Industrial Manufacturers located primarily in the Southeastern US. West Point offers build-to-print grey and ductile iron castings, machining, fabrication, and assembly services. There are very few manufacturers in the southern US that can offer all of the manufacturing services under one roof. Our Industrial Manufacturing customers are from a wide range of industries, including pumps, compressors/ blowers, copper wire, petroleum, mass transit, alternative energy, and many more. We have further diversified our business by adding a Contract Services Division, including West Point Mechanical and West Point Automation. West Point Mechanical provides rigging and millwright services for industrial machinery. They also provide Miscellaneous Metals and Installation services to General Contractors for building construction. 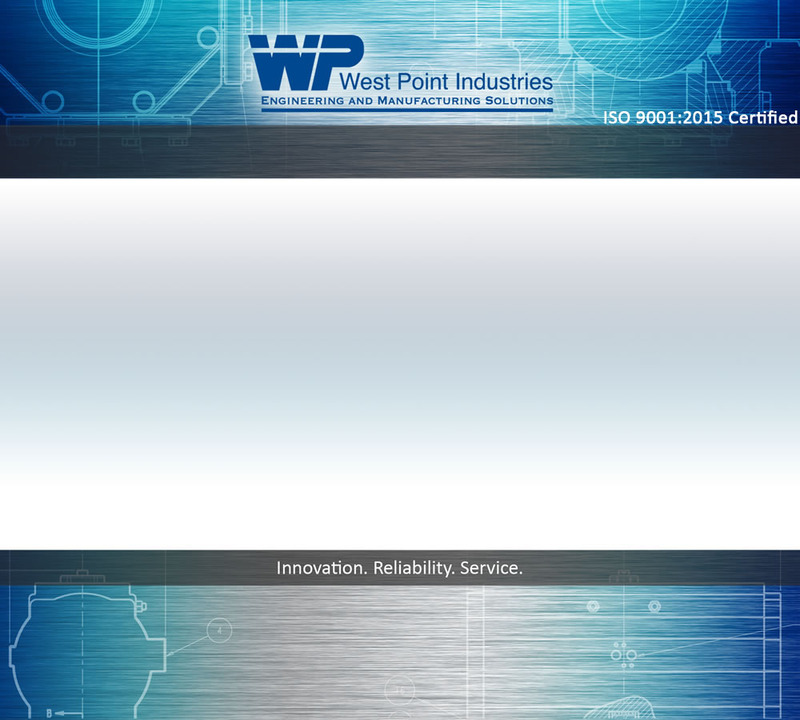 West Point Automation is an Information Technology service provider and develops custom process controls and data monitoring software for industrial companies. In 2006, West Point Industries began working with the US Department of Defense and many of the Prime Defense Contractors. West Point provides customized engineering and manufacturing solutions that are designed to improve process efficiency and safety. In 2010, West Point continued to expand its Government Contracting business by opening a Project Management and Engineering Office in Destin, FL to service the needs of Eglin AFB. We have submitted an application to the General Services Administration (section 871-3) for Professional Engineering Services and are hopeful to become a GSA Contract Holder in the summer of 2010. West Point has a long history as a supplier to the textile industry, but we recognize that our future is still being re-invented as an engineering and manufacturing business to the Department of Defense and Industrial Customers. We look forward to writing the next 140+ years of this company's history.